The Terracotta Warriors are one of the must-visit attractions for all travelers to China. 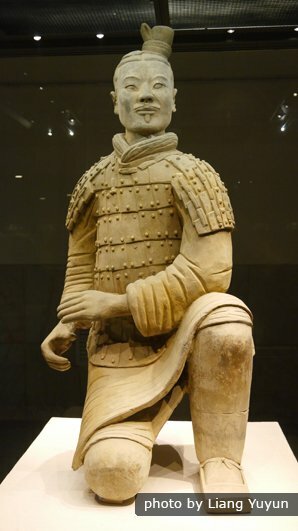 The dramatic exhibition reveals the secrets behind the 2,000-year-old army of clay statues that guarded the tomb of China&apos;s first emperor until a chance discovery in 1974. Here is the information you might need when you plan a tour to visit it. 1. Consider walking from the parking lot to the entrance. The parking lot is about 1 km from the entrance. There are shared golf carts running from the parking lot to the entrance. As you need to queue for them (in the busy travel season from May to October), we recommend you walk the 15 minutes or so there if you are able. Our guide will accompany you on the walk. 2. Maybe give the Mausoleum of Qin Shihuang a miss. 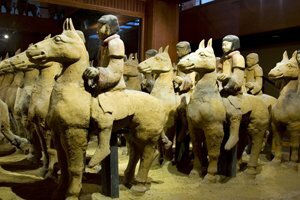 The ticket price for the Terracotta Warriors and Horses Museum includes entrance to the Mausoleum of Qin Shi Huang. You can take a free shuttle bus to go there if you are interested, taking around 10 minutes. It&apos;s not excavated yet, so there&apos;s not much to see, except a mound. You are recommended to visit the site by viewing at a distance instead of taking a close look at the model mockup of the interior. Travel with us, and you will be taken care of well by your private guide. For example, don&apos;t buy the book signed by the famer who claims to be one of the discovers of the Terracotta Army. They are all fake. Many play that role to rip off travelers. The book is over-priced at 180–200 yuan: (29–32 USD). Museum guides may recommend it to you! 4. And avoid the souvenir shops. When you finish your visit, you have to pass an area with a lot of souvenir shops. We don&apos;t recommend you buy gifts there, as they may be over-priced. A better place to buy souvenirs is the market in Xi&apos;an. 5. The restaurants around the museum aren&apos;t the best. There are many tourist restaurants around the museum, but lower your expectations on taste and quality. Some even may rip you off. Our guides choose the best available restaurant for our customers. 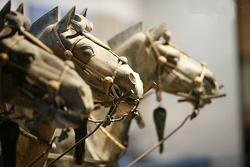 The highlights of the museum are the three pits where the warriors are on display, and the Exhibition of Bronze Chariots. Pit 1: This is the largest and most impressive, where about 2,000 terracotta warriors are displayed. Pit 2: This middle-sized pit has the most army units with archers, chariots, mixed forces, and cavalry. Pit 3: It is the smallest pit and represents the command post. 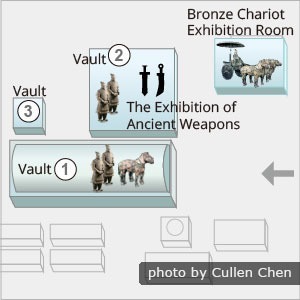 Our recommended visiting sequence is Pit 1 – Pit 3 – Pit 2 – Bronze Chariot Exhibit, as this way you will follow the Terracotta Army story from overall to detailed information. Time needed: Two to three hours are recommended for visiting this marvelous site. There is very little (good English) signage, so a guide is definitely needed to explain the exhibits, and help you get the most out of a visit. You have three choices: rent an audio guide, hire a guide at the museum; have a private guide included in your private tour (as we do). Our guide can lead you to learn how to make warriors from a local shokunin family. 1) Rent an audio guide (recorded guide). The cost is 40 yuan (deposit 200 yuan). The audio guide only provides limited and stilted introductions to certain parts of the museum. 2) Hire a guide at the museum. At the entrance, you&apos;ll be approached by English-speaking guides and asked if you want their services. The cost is around 150 yuan, and the quality of guiding you get varies. Try to avoid the commission shopping sites the guide may take you to. 3) Have a private guide (our recommendation). Our private Xi&apos;an guides are picked to be the best. 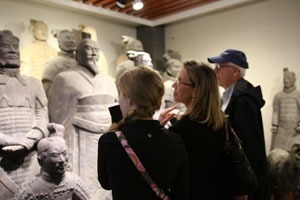 They will give you an expert appraisal of the Terracotta Warriors, answer your questions, navigate the crowds, and lead you to the best spots for photos. The Terracotta Army is an indoor attraction, which is not likely to be affected by weather, so it can be visited all year round. As the Terracotta Army Museum is one of the must-visit attractions in China, it is crowded most of the time, especially during weekends and Chinese public holidays such as National Day Holiday (October 1–7) and Labor Day Holiday (May 1–3). Start your day early and try to arrive before the large bus-tour groups arrive at around 10am. Or visit around noon when other visitors leave for lunch, if you do not mind having a late lunch. Visiting during the winter low season means fewer crowds, but the dry and cold weather is not so pleasant for Xi&apos;an&apos;s outside attractions. The entry fee is 150 yuan (March 1 – November 30); otherwise 120 yuan. Children under 1.2m enter free of charge. The ticket price includes entrance to the Mausoleum of Qin Shihuang, 1½ km (1 mile) from the Terracotta Army museum. If you are interest in it, you can have a look at a low-rated re-creation of the mausoleum of China&apos;s first emperor. The real mausoleum remains under its huge mound, not open to the public. 1. 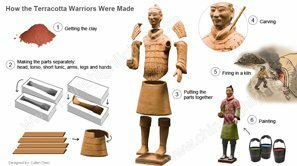 Book the tickets on the official website of the Terracotta Warriors Museum, if you can read Chinese or have some help. 2. Purchase the tickets on the site. You will need an ID card or passport for each person entering. If you buy tickets on site, we suggest you go to the museum early to avoid long queues and tickets being sold-out. 3. Enjoy a private tour in which your tickets are included. Your private guide will buy your tickets in advance and help you avoid lining up to purchase tickets and at the entrance ticket check. The Terracotta Army is 45 km (28 mi) east of Xi&apos;an city, taking about 1 hour by car. The most convenient way is to take a private tour. 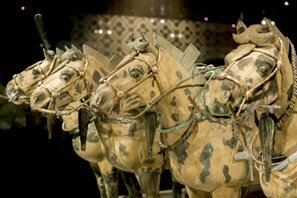 Your guide and driver will pick you up at your hotel and accompany you to the Terracotta Army. 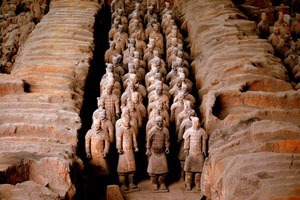 Many people wonder whether it is possible to take a day tour from Beijing to the Terracotta Army. The answer is yes, but it is very rushed. There are three ways to do it: by flight, by high-speed train, or by over-night train. The itinerary: early morning (or previous evening) start, afternoon Terracotta Army Visit, late return to Beijing. We suggest you to take a night train from Beijing to Xi&apos;an and fly back. You will have a more relaxing day and plenty of time to see the Terracotta Army this way. There are coffee shops in the museum. You can stop for a rest in several places when visiting. There are toilets inside and outside the museum grounds. They are all Chinese-style squat toilets. Bring your own toilet paper and hand sanitizer. This museum is designed to be friendly to wheelchair users: equipped with barrier-free access, and shared golf carts running from the parking lot to the entrance. On the left side of the Ticketing Office is the Tourist Information Center, which offers a free luggage storage service. If you don&apos;t want to waste time on finding a (non-con) taxi or public buses to the attraction, line up for tickets, read maps, make sense of Chinese signs, etc., a private tour is a great option. 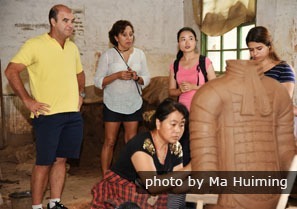 Learn how to make terracotta warriors and have some interaction with locals. It means that you will be well taken care of by a private guide and driver, and enjoy a lot of flexibility. Your guide will help you unravel the mysteries of the Terracotta Warriors, escape the crowds, and show you the best spots for photos. Tell us your requirements and one of our specialists will be in touch to plan a unique trip for you. 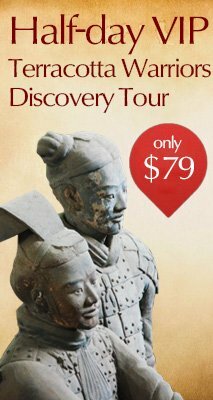 Daily VIP Xi&apos;an Terracotta Warriors and City Discovery Tour: Uncover the amazing history and vivid stories behind the terracotta figures. 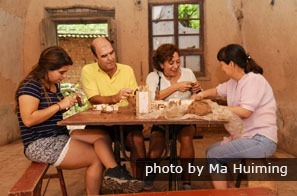 2-Day Essence of Xi&apos;an Private Tour: See all the must-sees of Xi&apos;an and learn how to make terracotta warriors. 4-Day Xi&apos;an Ancient Relics Tour: Dig deep into China&apos;s ancient culture with 4 days traveling around Xi&apos;an, capital of 13 ancient dynasties.